Saute cloves, cinnamon, cardamom and green chilies in ghee until softened about 3 minutes on COOK mode of rice cooker. Stir in onion and green peas and fry until soft and transparent. Then add cashews and raisins. Stir well. Add rice, milk, water and saffron strands. Stir everything to combine well. Cover the rice cooker bowl with lid and cook until cycle is complete. Stir in rose water and leave on WARM mode to enhance rose flavor in the rice. Finally garnish the rice with fruits. 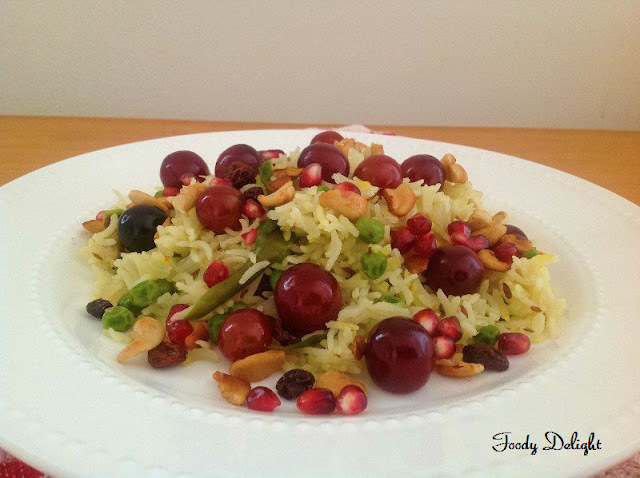 Loved the garnish on top,delicious pulao! 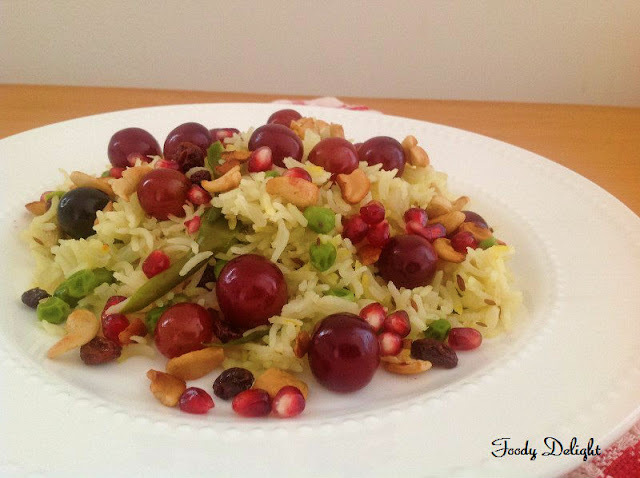 Yummy pulao,soo colourful and absolutely irresistible. My husband loves rice with raisins in it. The addition of pomegranate seeds make it look even more appealing. I would love it if you could bring it to my Virtual Eid Potluck Party. Hermosos plato colorido y saludable me encanta,saludos hugs,hugs. Hi pranjali and how are you? I am back to blogging..